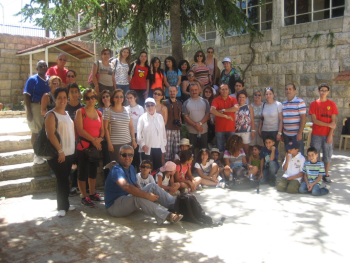 To top the Homecoming Weekend, the Alumni Relations Office organized on Sunday July 15 a trip to Douma. A group of around 50 alumni visited Douma which witnessed different ancient civilizations including Greek, Roman and Turkish, took an easy walk and learned about “Foie Gras” in Lebanon and stopped and met with local handicrafts in Douma. The group had a rural and lebanese lunch with a local family in the garden and finally took a tour in the old city of Byblos.